Policy Compliance | Qualys, Inc.
Assess security configurations of IT systems throughout your network. The solution we had in place could not scale to our growing requirements. We spent more time managing agents than in managing our compliance. Qualys was easy to use, easy to deploy and allows us to focus on what we do best, which is manage risk. With PC, you can leverage out-of-the-box library content to fast-track your compliance assessments using industry-recommended best practices such as CIS Benchmarks. PC also provides a centralized, interactive console for specifying the baseline standards required for different sets of hosts. You can quickly create policies based on a previously scanned host. By automating the evaluation of requirements against multiple standards for OSes, network devices and applications, PC lets you identify issues quickly and prevent configuration drift. With PC, you can prioritize and track remediation and exceptions, demonstrating a repeatable auditable process for compliance management focused on the most critical issues first. PC lets you customize and deliver comprehensive reports to document progress for IT staffers, business executives, risk managers and auditors. With mandate-based reporting you can easily see how you compare against requirements in a variety of overlapping regulatory or industry required control objectives. PC’s interactive editor organizes controls according to policies’ technologies, while search tools let you find relevant controls according to attributes. While setting up a control, you can immediately test the specified configuration. Select from an extensive controls library for OSes, network devices, databases and apps, and create custom controls without programming. Organizations often overlook improperly configured IT assets, underestimating their security and compliance risks. In fact, misconfigurations — like keeping default passwords, improper access control settings, weak encryption configuration, or insecure application deployment — are a major vector for breaches. Qualys PC automates the process of assessing security configurations, starting with configuring policies. Use a previously scanned host as a "golden image"
Create policies based on a previously scanned host in minutes. Qualys PC selects controls and setting values to match the master machine’s “golden image." Qualys PC’s interactive editor automatically organizes controls according to the technologies associated with each policy. Its search engine quickly finds relevant controls according to attributes such as name, category, framework, and others. 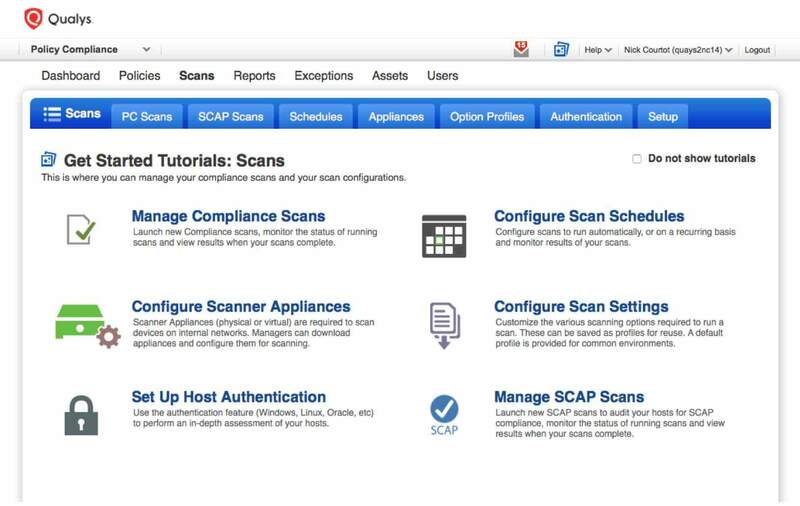 With Qualys PC, you can scan systems anywhere from the same console. You can select target hosts by IP address, asset group or IP range. After scanning deeply, you can create custom reports for each audience with the appropriate level of detail. Qualys PC automates the labor-intensive process of checking settings on each machine in your network. By helping you address violations quickly, before they get too far out of hand, Qualys PC makes remediation efforts more predictable and avoids last-minute emergencies during audits. By eliminating configuration fire drills, Qualys PC shifts the focus of your efforts to managing exceptions for specific hosts and situations. Qualys provides a documented, repeatable workflow for requesting, evaluating and approving exceptions. Approvals can be temporary, allowing issues to be automatically revisited after a specified length of time. Know whether your IT systems are compliant with configuration mandates. Issues can be resolved early, reducing or eliminating the chances for failed IT audits. Instead, with Qualys PC audits validate that you are following the kinds of best practices that reassure auditors. It’s essential to collect and analyze compliance data in order to evaluate and fine-tune IT security controls. Qualys PC gives you comprehensive compliance data so you can prioritize remediation and maintain all different stakeholders informed, including IT, business executives, risk managers and auditors. 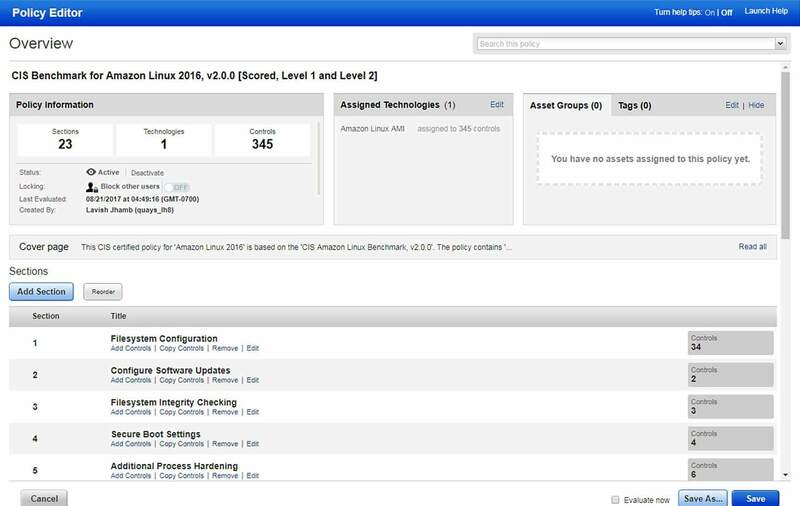 Qualys tracks configuration data across hosts and time, letting you use reports to better understand the security of your network. Draw from a library of built-in reports, change what’s shown or choose different sets of assets — all without having to rescan. Reports can be generated on demand or scheduled automatically and then shared with the appropriate recipients online, in PDF or CSV. Qualys helps you consolidate compliance results in different ways for clear, concise presentation to executives. Its graphical Scorecard reports allow you to examine multiple policies at once and see how compliance varied across different technologies and groups of assets. It also highlights changes over time, allowing you to track and compare different teams’ progress quickly. Qualys provides a systematic way to document that IT security policies have been defined and implemented. Auditors can quickly see that best practices are being followed and that violations are being found and fixed. Create custom report templates that communicate the right level of detail in the right way. Present scorecards to executives, connecting security results to business goals. Provide detailed drill-downs to IT teams who are checking into issues. With Qualys PC, decisions about risk and compliance management can be based on facts and data rather than guesses and instinct. It provides a continuously up-to-date view of how IT system configurations measure up to requirements and defined baselines. Qualys provides valuable data programmatically to other systems. Through a comprehensive set of XML-based APIs, your GRC and other compliance applications can obtain data about each host asset, initiate scans, and perform various other tasks. View your compliance posture in terms of the underlying security baseline against selected mandates by launching a mandate-based report. Use mandate-based report templates to create harmonized reports on compliance policies and mandates. Include remediation information for control technologies in compliance reports. 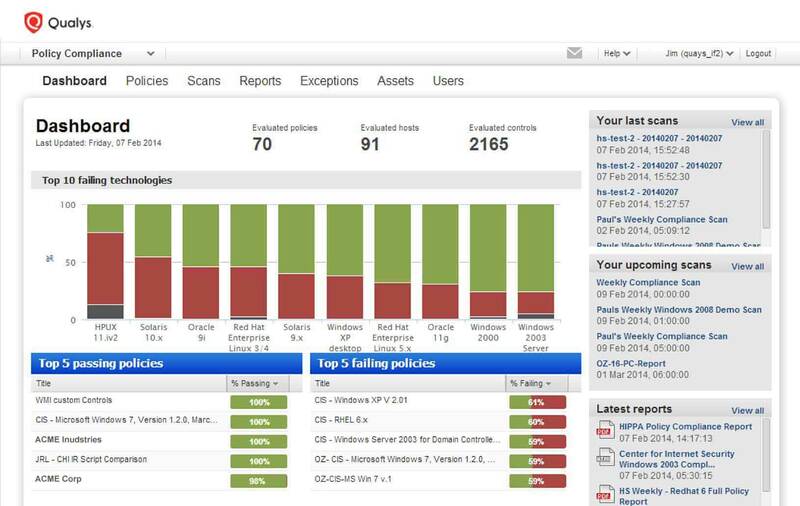 For system defined controls, reports display remediation information set by Qualys. For user defined controls, remediation information you set is displayed in the reports.